I saw an article a couple months ago about Gigi the musical being revived on Broadway this spring. 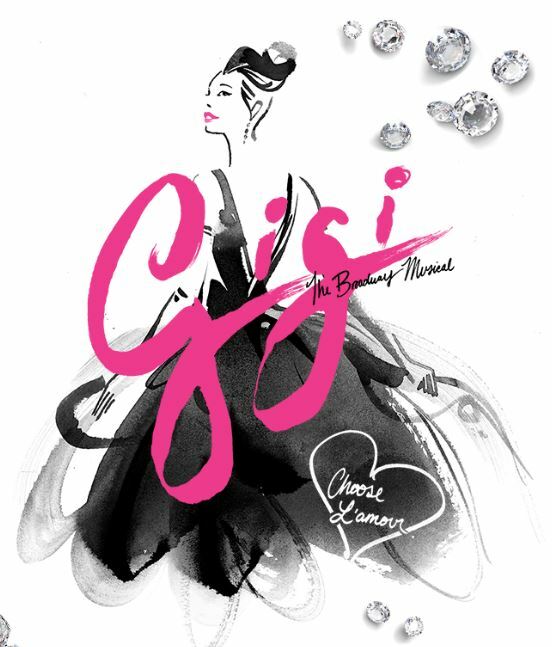 I love Gigi the movie and have seen it several times, so I was excited to hear it was coming to the stage. Then I heard that they were planning to preview the production in DC for a couple months before it went to Broadway. Bingo! Since my parents are also Gigi fans, it was a perfect excuse to trick them into visiting me. We had a quick but tasty pre-theater dinner at District Commons in Foggy Bottom, then headed to the Kennedy Center for the show! The big name in the production is Vanessa Hudgens who stars as Gigi. I believe this is her big Broadway debut (or at least debut in a leading role on Broadway). Hudgens is of course known for her role in High School Musical and other Disney productions. She does all her promotional shots in that black dress but it’s actually not in the production, it’s her curtain call dress. It’s not really true to the period which explains why it isn’t in the actual show, but I’m not sure why they decided it was a good look for the promos… Besides Hudgens, there are a few Broadway names, but no other headliners. First of all, I enjoyed the production. Second of all, they made some rather significant song changes that threw me for a loop. In the movie version, Maurice Chevalier plays Honore LaChaille, the narrator and wise older uncle to Gaston Lachaille (the leading man). He sings one of the signature songs: “Thank Heaven for Little Girls.” In this production they gave that song away to Gigi’s Aunt Alicia and Grandmother Mamita, and it lost a lot of the Chevalier charm in the process. Also, in this production, Gaston is interested in science and technology and spends a lot of time at the “Exhibition.” I’m not quite sure why they made that addition because outside of a little dialogue here or there it doesn’t do much to the plot at all. Of course every revival is going to have changes, but overall I thought it was a solid production. Hudgens was good, and I think Corey Cott who plays Gaston has potential. His songs always ended really strong but he needs to be a little more consistent throughout. In the movie Gaston is played by a much older Louis Jourdan but it was clear that they wanted to make the Gaston/Gigi relationship a little more plausible for the current audience (apparently a 30 year age gap just isn’t the norm anymore…). I thought the costumes and sets were great and made several nods to the original movie which was nice. Though it might have lost some of that “je ne sais quoi” from legends like Leslie Caron, Chevalier, and Jourdan, and I think it’s definitely worth the trip. It’s a great love story and period piece that makes me want to watch the movie again!